Hanoi (VNA) - Traditional martial arts have been developing for centuries in Vietnam, with hundreds of styles nationwide, including Nam Hong Son, Tay Son Binh Dinh and Vovinam. Vietnamese styles have been become popular around the world thanks to their typical characters and practicality. "Vietnamese martial art has developed because of its diversity, beauty and practicality. It is favoured not only because of the performances but also its origin and unique techniques. In comparison to other martial arts such as karate of Japan and taekwondo of the Republic of Korea, the Vietnamese styles use principles to help the soft to beat the hard, the short beat the long and the weak beat the strong," said master Thanh Phong of Thanh Phong Club in Hanoi. "All moves are designed to enhance comfort during practice and performance. It is much better when you practise in harmony with nature. This helps strengthen your skills and moves," Phong said. Vovinam is the most popular style of martial art in Vietnam, as well as around the world. On its 80th anniversary in late December, the Vietnam Vovinam Federation confirmed there were more than 2.5 million practising the martial art in 70 countries and territories. The strong growth of the art form can be seen through the establishment of the world federation, as well as continental federations in Asia, Europe and Africa. Master Nguyen Loc founded the martial art in 1936 and introduced it to the public two years later. Loc highlighted his so-called ‘revolution of mind’ to trainers, who are asked to always renew themselves and help others. Vovinam involves the use of different body parts such as hands, elbows, legs and knees. Trainers also learn to use weapons, including swords, knives and fans. They also practise attacking and defensive skills. Vovinam began to spread in 1970 and has developed in many countries with hundreds of schools in Poland, Belgium, Russia, France, and ASEAN members. The first world championship was organised in 2009, marking a turning point in its history. “I found that martial arts which are Olympic sports are easy to understand and practise. They also have beautiful moves. This is why they are popular all over the world. 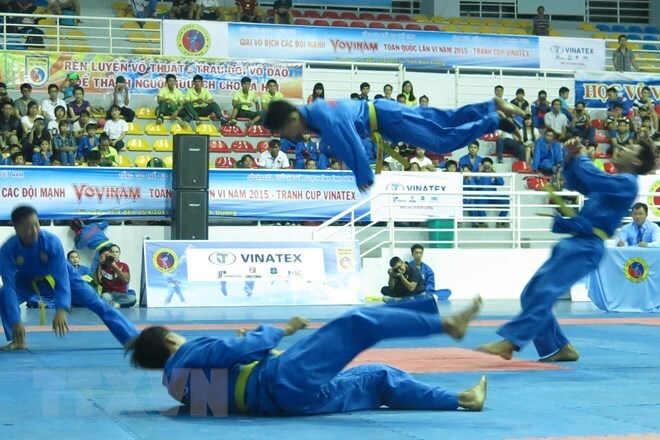 Vovinam needs to be improved following these trends so that it could be known widely, and in the near future it could be one of the official sports at official competitions," said Mai Huu Tin, President of the Vietnam Vovinam Federation. Nam Hong Son is a martial art that has existed for nearly 100 years and is practised mostly in northern Vietnam. It has become hugely popular in Hanoi with thousands of trainers. The martial art was developed as a combination between Vietnamese and Chinese styles by master Nguyen Nguyen To in 1920. In their first three years, practitioners learn Chinese styles. They later introduce Vietnamese techniques, as well as improving their strength and inner force. The martial art is home to many famous masters, including Mui Den, Ca Nham and Ba Den, who travelled around the country to compete. After nearly a century, the martial art has changed to make it more dynamic and effective but many original performances are still in existence. According to master Bui Dang Van, Nam Hong Son’s beautiful moves and special techniques attracted attention in Poland, the Czech Republic and Germany. The martial art has also made its mark on the national film industry. Van and some other masters have been chosen as martial art directors in a number of movies. He is one of the first masters to open centres which choreograph stunts and train actors since 1993. Masters of Nam Hong Son also collaborated to develop other foreign martial arts such as pencak silat and wushu in Vietnam. Vietnam has seen some success in these martial arts at international competitions. On the subject of traditional martial arts, Binh Dinh province in the central region cannot be ignored. Martial arts are diversified with many skills and a complicated range of moves, using the yin and yang theory as a guiding principle. Based on the purpose of fighting in war it is effective and suitable for Vietnamese people who are generally small in stature. Like other martial arts, Tay Son Binh Dinh is practised with and without weapons. It involves the use of the hands and legs. Apart from cudgels, spears and swords, Binh Dinh masters could also use scarves, short staffs and poisonous weapons. Inner force and strength are also important in this art form. The best masters could lie on broken glass while being run over by a truck, or let sharp spears stab their throats. Today, visitors to martial arts villages or schools in Binh Dinh have the chance to learn about the history and development of particular styles as well as watch typical performances or even take part in training with masters. Master Laabi Hatim from Morocco has practised Vietnamese martial arts since 1980. He said he was initially attracted because it showed the rich culture of Vietnam but was also a really effective form of combat. Hatim is just one of many foreigners who train in Vietnamese martial arts. He flies to Vietnam and visits Binh Dinh to learn more every year. In a congress of the Vietnam Traditional Martial Arts Federation last June, delegates spoke about solutions to maintain and develop Vietnamese styles in the coming years.